Three questions must be answered about central bank independence in this new era. If inflation is now too low, not too high, is central bank independence necessary? If central banks must coordinate with fiscal policy at the zero lower bound, is central bank independence feasible? And as central banks take on more powers with complex objectives, uncertain transmission mechanisms, and distributional impacts, is central bank independence democratic? Central banks around the world were made more independent in the 1990s-2000s based on a large body of theoretical and empirical evidence. Independent central banks, it was argued, would protect the currency from politically engineered business cycles and pressure to finance deficits (Buchanan and Wagner 1977, Sargent and Wallace 1981), and would overcome time-inconsistency problems (Rogoff 1985, Kydland and Prescott 1977, Barro and Gordon 1983). Evidence from advanced economies suggested that central bank independence was negatively related to inflation at no cost to output or employment (e.g. Grilli et al 1991, Alesina and Summers 1993, Cukierman 2008). Source: Alesina and Summers (1993). The most commonly used measures of central bank independence combine two distinct concepts: the idea that a central bank should be operationally independent from government in carrying out monetary policy, and the idea that a central bank should be fully politically insulated from the possibility of government influence (Grilli et al 1991, Debelle and Fischer 1994).4 While most academic analyses argue in favour of both components – the more independence, the better – many conclude that only the operational element matters (including Debelle and Fischer 1994, Tucker 2016). Central bankers themselves seem to agree with the latter: in the Bank of England’s (2000) survey of central bankers from 60 countries, 80% defined independence as the “capacity to set instruments and operating procedures”. This distinction is increasingly important: central banks’ post-crisis powers may conflict with political independence if they require significant oversight or close cooperation with government, but are likely to be compatible with operational independence. 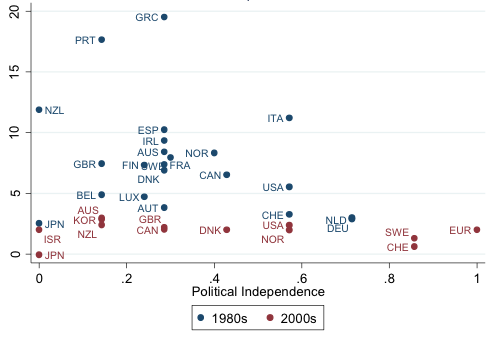 In a recent paper, we revisit the relationship between operational and political independence and inflation in advanced economies (Balls et al. 2016). Using the indexes of Grilli et al. (1991) and Arnone et al. (2007), our measure of operational independence includes the capacity to set the discount rate and the existence of systems preventing central bank lending to government, and political independence includes indicators of government influence over central bank personnel including appointment procedures and term length. Figures 3 and 4 plot operational and political independence against inflation for advanced economies in the 1980s, controlling for real GDP per capita, openness, and the exchange rate regime. 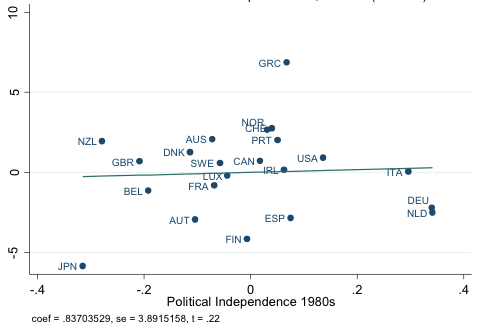 As Figure 3 demonstrates, operational independence and inflation were strongly negatively related, while political independence and inflation had no relationship (consistent with Debelle and Fischer 1994, DeHaan and Kooi 1997). Over the 1990s-2000s, almost all advanced economy central banks became fully operationally independent. None except the ECB became fully politically independent. So when looking at the pre-crisis 2000s, all advanced economies had both high operational independence and low inflation. With so little variation in either measure, the claim that the inflation–independence relationship has disappeared cannot be decided empirically. 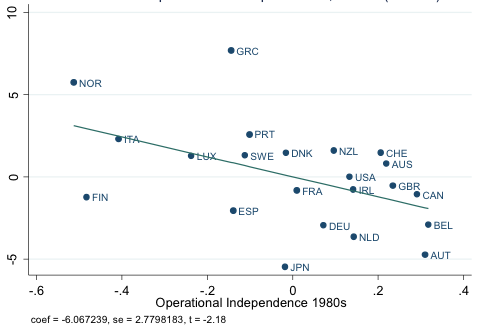 But as Figure 5 illustrates, data from the 2000s could certainly be consistent with previous decades’ relationship between inflation and operational independence. The above results tend to support the Bank of England model of monetary policy independence: fully operationally independent, with control over interest rate setting and its own finances, but somewhat politically dependent, accountable to government through the appointment of the governor and board and the inflation target (Balls and O’Donnell 2001). But is the Bank of England model still the right one? Over recent years, inflation has been too low in many advanced economies, not too high. If liquidity traps become the new normal, the case for operational independence becomes less compelling, as greater coordination with fiscal policy is needed. On the other hand, with UK GDP growth and inflation back to trend and a continuing global recovery, it does not seem implausible that too-high inflation could return – meaning preserving operational independence remains important. If so, can it be compatible with effectiveness and accountability in central banks’ new financial stability powers? In Balls et al. (2016), we develop a framework to guide the institutional design of central banks’ new powers. We focus on three broad questions: What benefits would locating the function in the central bank bring (in terms of resources, expertise, and independence from government)? How does the function interact with monetary policy? And does the function pose a threat to the central bank’s operational independence? Our framework suggests that to make operational independence work, further reforms are needed to the Bank of England model in both monetary–fiscal coordination and macroprudential policy. Before the financial crisis, there was consensus that monetary policy could generally achieve optimal output stabilisation. Monetary–fiscal coordination was at best unnecessary, at worst dangerous. But the persistence of the zero lower bound in many economies has demonstrated that in some circumstances, monetary–fiscal coordination is needed to avoid monetary and fiscal policy working at cross purposes (if the government pursues austerity while the central bank attempts ultra-expansionary monetary policy for example; or if government debt management counteracts central bank quantitative easing (Summers et al. 2014)). In extreme cases, where government ability to carry out debt-financed fiscal stimulus is limited, money-financed fiscal stimulus should not be ruled out. Can this coordination be compatible with operational central bank independence? We argue that it can, as long as a mechanism is carefully designed to respect the following three principles: it should be triggered by the Bank of England, protect government control over fiscal policy, and be limited to the zero lower bound. One example would be an open letter, sent when interest rates are below a pre-defined level close to zero, in which the Bank of England outlines its non-binding views about the appropriate stance of fiscal policy. For the rare situations when money-financed fiscal stimulus may be needed, the Bank of England could credit a special government spending account with a pre-defined sum (akin to proposals by Bernanke 2016 and Turner 2016). The financial crisis demonstrated a need for the monitoring of systemic risks and for macroprudential tools to counter them. But little consensus exists over who should have these powers, with very different systems created in the UK, US, and Eurozone. There are compelling arguments for the central bank to be responsible for macroprudential policy. It has the relevant resources, expertise and institutional capacity. It has the ability to internalise interactions between macroprudential policy and monetary policy (Stein 2013). And since macroprudential policy, like monetary policy, is vulnerable to political influence and time-inconsistency, it should be operationally independent from government. On the other hand, it is much more difficult to design an accountability framework for macroprudential policy than monetary policy. We know relatively little about the appropriate ways to measure systemic risk, specify goals for macroprudential policy, or understand its transmission mechanism and optimal reaction function. Macroprudential regulators may frequently need to expand their toolkit as risks shift elsewhere in the financial system. And macroprudential policy can be politically sensitive, requiring trade-offs between financial stability and economic dynamism, and creating first-order distributional impacts (e.g. loan-to-income limits on mortgages disproportionately affect first-time buyers). The Bank of England’s Financial Policy Committee currently deals with systemic risk oversight and macroprudential policy. With Bank of England, Prudential Regulation Authority and Financial Conduct Authority representatives, external members, and a Treasury observer, it enables a coherent overview of systemic risks and effective decision-making – but it has insufficient Treasury involvement in goal-setting, leaving macroprudential policy decisions lacking democratic accountability. We argue that macroprudential policymaking and systemic risk oversight should be separated into different bodies. The systemic risk body would monitor systemic risks and set a broad mandate for macroprudential policy. Taking inspiration from the Financial Stability Oversight Council in the US, its make-up would include government and other financial regulators more prominently alongside Monetary Policy Committee members to maximise information sharing, minimise risk of groupthink, and coordinate institutional responses. The Chancellor would chair the body, ensuring political legitimacy for the macroprudential mandate. The macroprudential body should remain operationally independent in the Bank of England, however, with a broad and flexible toolkit to meet the mandate set by the systemic risk body, and the ability to request new powers from the government. Twenty years after independence, the case for Bank of England operational independence remains strong. At the same time, the new powers it has acquired since the financial crisis require a new framework to reconcile operational independence with effectiveness and accountability. No country has perfected a monetary–fiscal coordination system, but in macroprudential policy the UK can take inspiration from the US’s Financial Stability Oversight Council for a broader and more accountable systemic risk body. At the same time, the Federal Reserve and the ECB can look to the Bank of England’s more expansive macro-prudential toolkit and mechanism to request new powers. While central banks should maintain their operational independence, neither the UK, US, nor Eurozone have yet alighted on the best way to structure their central banks’ new powers in today’s challenging environment. Authors’ note: This column draws from research published in Balls, Howat and Stansbury (2016) “Central Bank Independence Revisited: After the Financial Crisis, What Should a Model Central Bank Look Like?”. (available at: https://www.hks.harvard.edu/centers/mrcbg/publications/awp/awp67). Alesina, A, and Summers, L H (1993), “Central Bank Independence and Macroeconomic Performance: Some Comparative Evidence”, Journal of Money, Credit and Banking 25(2): 151-162. Balls, E, J Howat and A Stansbury (2016) “Central Bank Independence Revisited: After the Financial Crisis, What Should a Model Central Bank Look Like?”, Harvard Kennedy School Mossavar-Rahmani Centre for Business and Government Associate Working Paper No. 67. Balls, E and G O’Donnell (eds.) (2001), Reforming Britain’s Economic and Financial Policy: towards greater economic stability. HM Treasury. Barro, R J, and D B Gordon (1983), "Rules, Discretion and Reputation in a Model of Monetary Policy," Journal of Monetary Economics 12(1): 101-121. Blinder, A, M Ehrmann, J de Haan and D Jansen (2017), “Necessity as the mother of invention: Monetary policy after the crisis”, Economic Policy (forthcoming). Buchanan, J. M., & Wagner, R. M. (1977). Democracy in Deficit. New York: Academoc Press. de Haan, J, & Kooi, W (1997), “What Really Matters? Conservativeness or Independence?”, Banca Nazionale del Lavoro Quarterly Review, 200, 23-38.
den Haan, W, M Ellison, E Ilzetzki, M McMahon, R Reis (2017), “The Future of Central Bank Independence: Results of the CFM-CEPR Survey”, VoxEU.org, 17 January 2017. Debelle, G, and Fischer, S (1994). 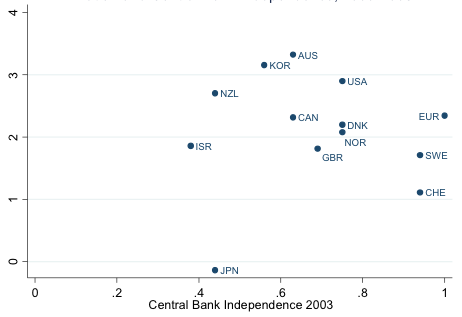 “How Independent Should a Central Bank Be?”, Working Papers in Applied Economic Theory. Fels, J (2016), “The Downside of Central Bank Independence”, Pimco Macro Economic Perspectives. Fischer, S (2015), “Macroprudential Policy in the U.S. Economy”, Macroprudential Monetary Policy, Boston: 59th Economic Conference of the Federal Reserve Bank of Boston. Giles, C, (2012), “Bank independence was a well-intentioned failure”, Financial Times, 9 March 9. Greenwood, R, S G Hansen, J S Rudolph, and L H Summers (2014), “Government Debt Management at the Zero Lower Bound”, Brookings Hutchins Center Working Paper. Grilli, V, D Masciandaro, and G Tabellini (1991), “Political and Monetary Institutions and Public Finance Policies in the Industrial Countries”, Economic Policy, 341-92. Issing, O (2011), “Lessons for Monetary Policy: What Should the Consensus Be?”, IMF Working Papers. Kydland, F, and E Prescott (1977), “Rules Rather than Discretion: the Inconsistency of Optimal Plans”, Journal of Political Economy 85 , 473-491. Plosser, C I (2016), “Panel on Independence, Accountability, and Transparency in Central Bank Governance”, Chapter 6 in JH Cochrane and JB Taylor (eds. ), Central Bank Governance and Oversight Reform, Hoover Press. Rogoff, K (1985), “The Optimal Degree of Commitment to an Intermediate Monetary Target”, Quarterly Journal of Economics 100: 1169-1189. Sargent, T J, and N Wallace (1981), “Some Unpleasant Monetarist Arithmetic”, Federal Reserve Bank of Minneapolis Quarterly Review (Fall), 1-17. Stein, J (2013), “Overheating in Credit Markets: Origins, Measurement, and Policy Responses”, in Restoring Household Financial Stability after the Great Recession: Why Household Balance Sheets Matter. St. Louis, Missouri: Federal Reserve Bank of St. Louis. Tucker, P (2016), “How Can Central Banks Deliver Credible Commitment and Be “Emergency Institutions”? ", Chapter 1 in JH Cochrane and JB Taylor (eds. ), Central Bank Governance and Oversight Reform, Hoover Press. Turner, A (2015), “The Case for Monetary Finance – An Essentially Political Issue”, 16th Jacques Polak Annual Research Conference. Washington: IMF. Central banks have accumulated powers in crisis management, macro-prudential policy and systemic risk supervision, and unconventional monetary policy. Blinder et al.’s (2017) survey of central bank governors and academic economists suggests that these changes are expected to be permanent: the vast majority of both groups expect central banks to “have broader mandates and use macro-prudential tools more widely than before the crisis”. In the UK, former Foreign Secretary and former Leader of the Conservative Party William Hague wrote in November 2016 that unless central banks change course soon, “they will find their independence increasingly under attack”. Michael Howard and Iain Duncan Smith, former Conservative party leaders, and Nigel Lawson and Norman Lamont, two former Chancellors, wrote during the pre-referendum debate that there had been “a woeful failure on the part of the Bank of England, the Treasury and other official sources to present a fair and balanced analysis”. Leader of the Opposition Jeremy Corbyn had proposed a “People’s Quantitative Easing” in August 2015. Economic commentators have questioned the value of central bank independence, including Chris Giles in the Financial Times arguing that central bank independence was a “well-intentioned failure” (Giles 2012). In the US, Senator Rand Paul and Representative Thomas Massie reintroduced the “Audit the Fed” bill in January 2017, which would allow the Government Accountability Office to audit the Federal Reserve’s “deliberations, decisions or actions on monetary policy matters”. As a presidential candidate, President Donald Trump expressed support for the bill, alongside candidates Marco Rubio and Bernie Sanders. In the Eurozone, German finance minister Wolfgang Schäuble has commented frequently on his opinion of what the ECB should do (e.g. in Feb 2017: “it would presumably be right if the ECB dared to exit [ultra-expansionary monetary policy] this year”); in April 2016, his comments were construed as implying that the ECB bears some responsibility for the rise of far-right party AfD in Germany. In 2015, the ECB faced legal challenges over its Outright Monetary Transactions policy. The CFM-CEPR Survey of Macroeconomists in Europe revealed that “the well-established proposition among economists that a reduction in central bank independence will lead to higher inflation is no longer taken for granted” (Den Haan et al. 2017). Different authors draw slightly different delineations. Grilli et al. 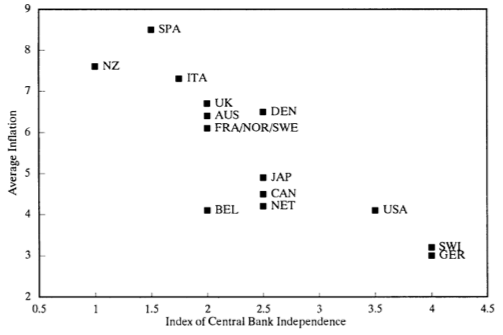 (1991) distinguish between “economic” and “political” independence of the central bank; Debelle and Fischer (1994) distinguish between “instrument”, “goal” and “political” independence; and de Haan and Kooi (1997) and distinguish between “policy” independence, “personnel” independence, and “financial” independence. 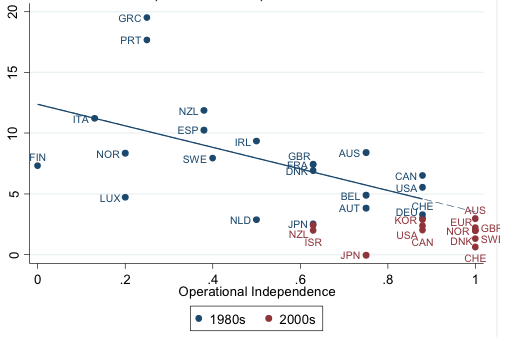 Our measure of operational independence corresponds to Debelle and Fischer’s instrument independence measure, and is close to Grilli et al.’s economic independence and de Haan and Kooi’s policy/financial independence.